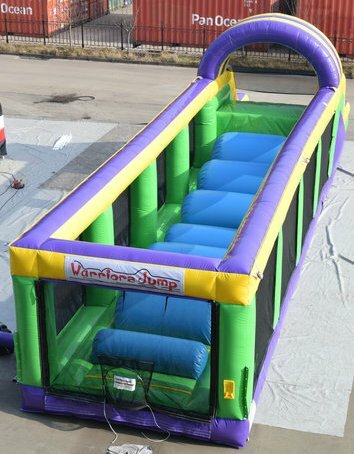 Add to the competition with our Warriors Jump Obstacle Course. Use as a stand alone unit or add it to one of our Radical Run Obstacle Course Challanges. Need something else to keep the party going strong - consider adding games to your event. This radical course is unlike any other. It is designed to entertain the guests and challenge the participants. Players will start on one side and must jump or run accross the platforms, ending up with a slide finish. uses two of the four available units to create an obstacle course challenge. Fun for all who particiate - Compete with your family, friends and co-workers in our interchangable obstacle course! Make it to the slide on the opporsite side without falling off and in the fastest time and you win. This can be used as a stand alone unit or combined with up to 4 other pieces in the Radical Run Obstacle Course family.